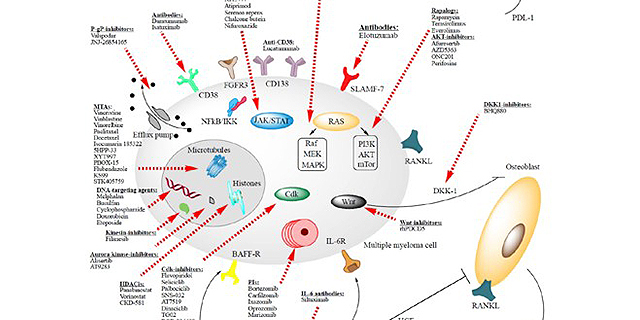 Cancer Drug Resistance is an international peer-reviewed, open access, quarterly online journal established in March, 2018. The journal focuses on pharmacological aspects of drug resistance and its reversal, including drug design, drug delivery, drug distribution and cellular drug resistance, etc. 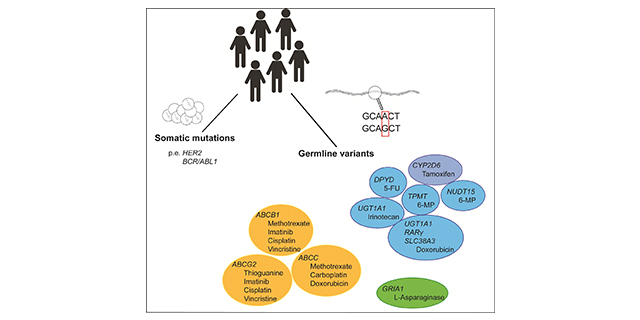 Cancer pharmacogenetics implies a complex combination of germline variants from the patient and somatic mutations in tumor cells. Somatic mutations meanwhile have become drugable targets or biomarkers, whereas germline mutations potentially predict adverse drug effects or drug response. Here, we evaluate hereditary variants in biotransforming enzymes and drug transporters, such as thiopurine S-methyltransferase, UDP-glucuronosyltransferase (UGT1A1), dihydropyrimidine dehydrogenase (DPD), as well as ABC transporters (ABCB1, ABCG2 and ABCC subfamily) with respect to cytostatics and targeted therapies. Furthermore, gene expression regulation with regards to epigenetics and posttranscriptional modification are discussed. Fluoropyrimidines (FP) are given in the combination treatment of the advanced disease or as monotherapy in the neo-adjuvant and adjuvant treatment of colorectal cancerand other solid tumors including breast, head and neck and gastric cancer. FP present a narrow therapeutic index with 10 to 26% of patients experiencing acute severe or life-threatening toxicity. With the high number of patients receiving FP-based therapies, and the significant effects of toxicities on their quality of life, the prevention of FP-related adverse events is of major clinical interest. Host genetic variants in the rate limiting enzyme dihydropyrimidine dehydrogenase (DPYD) gene are related to the occurrence of extremely severe, early onset toxicity in FP treated patients. The pre-treatment diagnostic test of 4 DPYD genetic polymorphisms is suggested by the currently available pharmacogenetic guidelines. Several prospective implementation projects are ongoing to support the introduction of up-front genotyping of the patients in clinical practice. Multiple pharmacogenetic studies tried to assess the predictive role of other polymorphisms in genes involved in the FP pharmacokinetics/pharmacodynamic pathways, TYMS and MTHFR, but no additional clinically validated genetic markers of toxicity are available to date. The development of next-generation sequencing platforms opens new possibilities to highlight previously unreported genetic markers. Moreover, the investigation of the genetic variation in the patients immunological system, a pivotal target in cancer treatment, could bring notable advances in the field. This review will describe the most recent literature on the use of pharmacogenetics to increase the safety of a treatment based on FP administration in colorectal cancer patients. 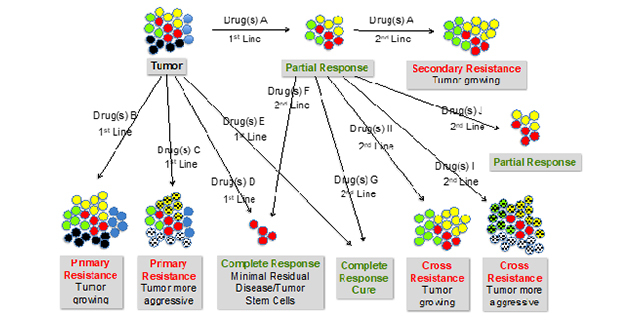 Cancer drug development is a time and resources consuming process. Around 90% of drugs entering clinical trials fail due to lack of efficacy and/or safety issues, more often after conspicuous research and economic efforts. Part of the discarded drugs might be beneficial only in a subgroup of the study patients, and some adverse events might be prevented by identifying those patients more vulnerable to toxicities. The implementation of pharmacogenomic biomarkers allows the categorization of patients, to predict efficacy and toxicity and to optimize the drug development process. Around seventy FDA approved drugs currently present one or more genetic biomarker to keep in consideration, and with the progress of Precision Medicine tailoring therapies on individuals’ genomic landscape promises to become a new standard of cancer care. 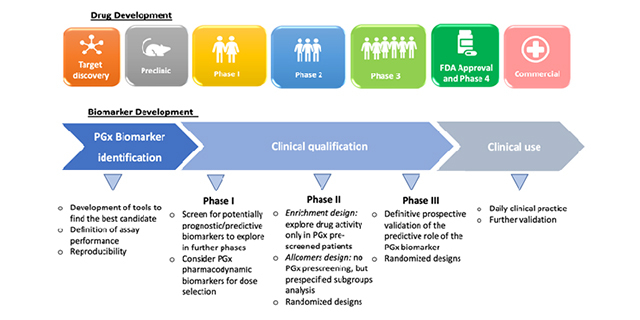 In the current article we review the role of pharmacogenomics in cancer drug development, underlying the advantages and challenges of their implementation. This review describes the mechanism of action - inhibition of microtubules - and the most important mechanisms of resistance for vinca alkaloids, taxanes and epothilones. Resistance is a major problem in vinca and taxane chemotherapy and arises in most cases from overexpression of efflux pumps that transport the drugs out of the cancer cells and from modifications of the target, the microtubules, by overexpression of tubulin isotypes or by attachment of proteins to the ends of the microtubules so that the target is no longer recognized by the drugs. In some cases, however, this process can have the opposite effect, leading to sensitization, e.g., for vinca alkaloids in cases where taxanes are not or no longer effective. The link between resistance due to efflux pumps and the pharmacokinetics and metabolism of the drugs is also covered. Other types of resistance that are addressed include detoxification of drugs within the cancer cell and blockade of apoptosis, post-translational modifications of microtubules and other protein pathways, micro-RNAs, induction of oncogenes, and cancer stem cells, which, taken together, offer particularly multifold possibilities for preventing drug activity. The use of biomarkers for the prediction of clinical outcome and for the direction of future therapy is also addressed. 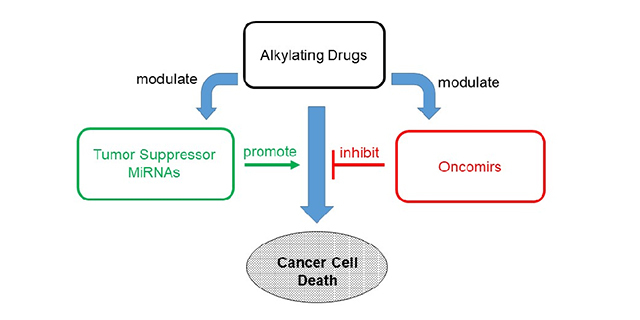 Alkylating agents represent an important class of anticancer drugs. The occurrence and emergence of tumor resistance to the treatment with alkylating agents denotes a severe problem in the clinics. A detailed understanding of the mechanisms of activity of alkylating drugs is essential in order to overcome drug resistance. In particular, the role of non-coding microRNAs concerning alkylating drug activity and resistance in various cancers is highlighted in this review. Both synthetic and natural alkylating agents, which are approved for cancer therapy, are discussed concerning their interplay with microRNAs. The aim of this work was to supply an overview of the germline Pharmacogenetics that can be already implemented in the oncology clinical practice. An explanation of the three pillars considered necessary for determining which genetic polymorphisms should be used has been provided. These are PharmGKB single nucleotide polymorphism (SNP)-Drug Clinical Annotations with levels of evidence 1 or 2; the genetic information provided in the drug labels by the drug regulatory main agencies (Food and Drug Administration and European Medicines Agency, mainly); and the guidelines elaborated by international expert consortia (mainly Clinical Pharmacogenetics Implementation Consortium and Dutch Pharmacogenetics Working Group). A summary of the relevant SNPs and the recommendations on how to apply their results has also been compiled. Despite progress in understanding molecular aberrations that contribute to the development and progression of ovarian cancer, virtually all patients succumb to drug resistant disease at relapse. Emerging data implicate bioactive sphingolipids and regulation of sphingolipid metabolism as components of response to chemotherapy or development of resistance. Increases in cytosolic ceramide induce apoptosis in response to therapy with multiple classes of chemotherapeutic agents. Aberrations in sphingolipid metabolism that accelerate the catabolism of ceramide or that prevent the production and accumulation of ceramide contribute to resistance to standard of care platinum- and taxane-based agents. 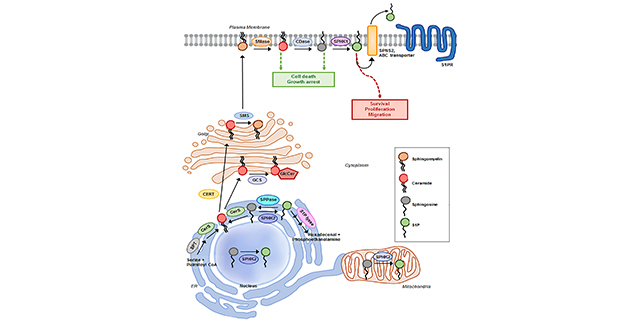 The aim of this review is to highlight current literature and research investigating the influence of the sphingolipids and enzymes that comprise the sphingosine-1-phosphate pathway on the progression of ovarian cancer. The focus of the review is on the utility of sphingolipid-centric therapeutics as a mechanism to circumvent drug resistance in this tumor type. 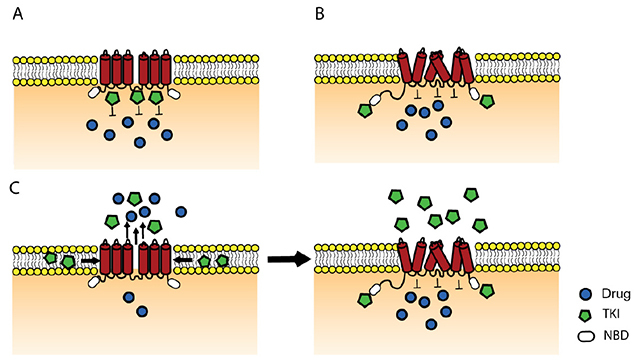 How to overcome ATP-binding cassette drug efflux transporter-mediated drug resistance? P-glycoprotein (ABCB1), multidrug resistance protein-1 (ABCC1) and breast cancer resistance protein (ABCG2) belong to the ATP-binding cassette (ABC) superfamily of proteins that play an important physiological role in protection of the body from toxic xenobiotics and endogenous metabolites. Beyond this, these transporters determine the toxicity profile of many drugs, and confer multidrug resistance (MDR) in cancer cells associated with a poor treatment outcome of cancer patients. It has long been hypothesized that inhibition of ABC drug efflux transporters will increase drug accumulation and thereby overcome MDR, but until now no approved inhibitor of these transporters is available in the clinic. In this review we present molecular strategies to overcome this type of drug resistance and discuss for each of these strategies their promising value or indicate underlying reasons for their limited success. Multiple myeloma (MM), a malignancy of plasma cells, is the second most prevalent blood cancer (10%). A PubMed search has been conducted for English research papers and reviews published until January 2018. Numerous drugs are used in treatment of MM. These include the antineoplastic alkylating agents cyclophosphamide, busulfan and melphalan, immunomodulators such as lenalidomide and thalidomide, corticosteroids including dexamethasone, microtubule-targeting agents, such as paclitaxel and vinca alkaloids, as well as the proteasome inhibitors bortezomib and carfilzomib. Despite the considerable number of treatment options, MM is still difficult to treat, which is mirrored by the poor 10-year survival rate of 3%. Resistance to chemotherapy is often the cause for therapy failure. These resistances can be due to the overexpression of efflux pumps, genetic and epigenetic aberrations and the microenvironment of MM. With the gain of knowledge regarding genetic and molecular changes, many molecular targeted therapies including cell signaling targeted therapies are being developed against relapsed/refractory MM. Additionally, epigenetic aberrations such as DNA methylation and histone modifications steered MM management in new directions. Amongst these novel targeted therapies, inhibitors of histone deacetylase, Aurora kinase, inhibitors of the PI3K/AKT/mTOR pathway and cyclin dependent kinases are promising. Aim: Mitomycin C (MMC) is a commonly used as intravesical treatment for superficial bladder cancer. However, its role in combination with ras inhibition has not been investigated. 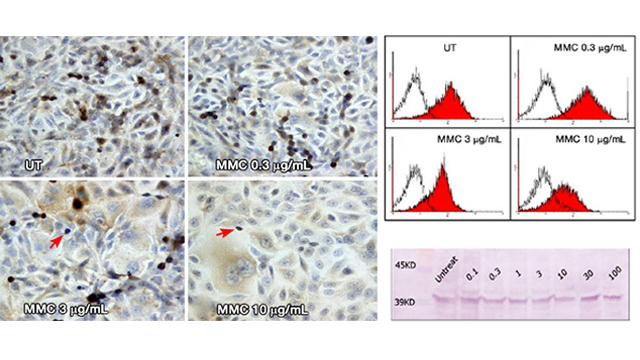 The aim of this study was to explore the role of ras in MMC-induced apoptosis in T24 bladder cancer cells and to determine the efficacy of combination therapy in vitro. Methods: We measured the effects of various doses of MMC on apoptosis induction as well as on ras, ERK and Ki-67 protein expression by T24 cell line using immunocytochemistry, flow cytometry and Western blotting. We also tested the effect of siRNA on ras employed singly or in combination with MMC. Results: T24 cells expressed high level of ras protein. MMC treatment increased the level of ras and ERK protein expression after 24 h, and decreased these levels after 72 h. Ras siRNA (100 nmol/L) caused massive apoptosis associated with a marked decrease in ras expression in T24 cells. When combined with low doses of MMC, ras siRNA (50 nmol/L) sensitized T24 cells to apoptosis and decreased their expression of ras. The effect of combined therapy was higher than that of either compound used alone. Expression levels of ERK, a downstream target of ras, declined following combination therapy. Conclusion: Ras siRNA in combination with low dose MMC is a possible treatment strategy for patients with ras-positive bladder tumors. 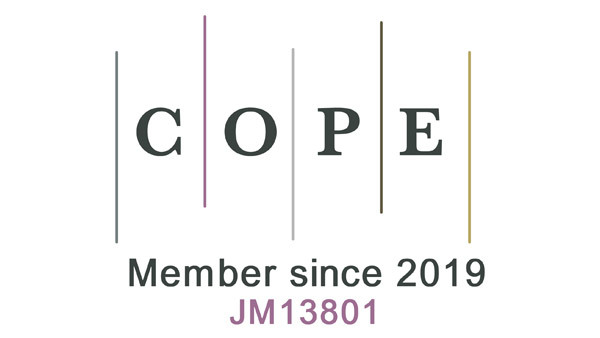 Aim: To investigate the effects of cisplatin on the human non-small cell lung carcinoma (NCI-H460) cell line regarding cytotoxicity, genotoxicity, and expression of genes associated with apoptosis (BIRC5) and autophagy (BECN1). Methods: Cell cultures were treated with cisplatin concentrations (0.16-33.3 μmol/L) for 48 h. Mutagenicity and acute and chronic cytotoxicities were assessed using the MTT, clonogenic, and cytokinesis-block micronucleus assays. Gene expression of BIRC5 and BECN1 was evaluated by reverse transcription-polymerase chain reaction. Results: Cisplatin IC50 (0.33 μmol/L) increased micronucleus frequency 2.50 times. Cisplatin was also cytotoxic in the 0.6-33.3 μmol/L range, with reduced expression of the BIRC5 gene, suggesting induction of apoptosis. Besides reducing the expression of the BIRC5 gene, 33.3 μmol/L cisplatin increased the expression of the BECN1 gene, suggesting that autophagy can be related to cisplatin resistance. 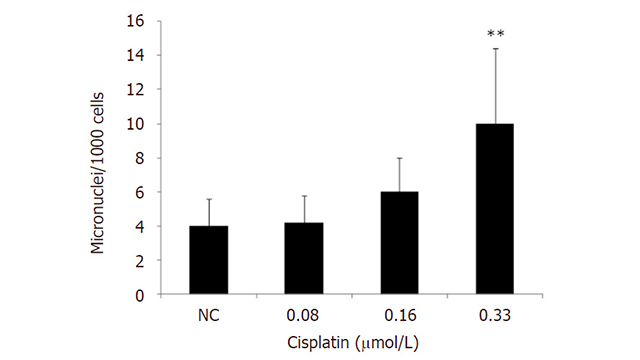 Conclusion: Cisplatin inhibited NCI-H460 growth, and cisplatin IC50 induced genotoxic damage. When higher cisplatin concentrations are used, the expression of genes associated with apoptosis and autophagy was changed. This results points to a further investigation of the role of autophagy in cisplatin resistance. 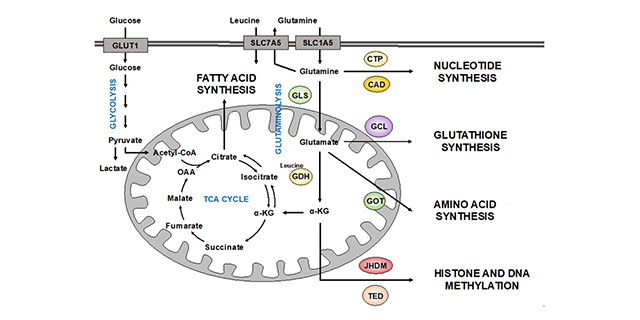 The amino acid glutamine plays a key role in the metabolism of highly proliferating cells. During malignant transformation, cancer cells modify the consumption and processing of glutamine to sustain cell growth and proliferation. In some cases, these cancer cells become addicted to glutamine. Thus, targeting the metabolism of glutamine has been developed during last years as a potential strategy against cancer. 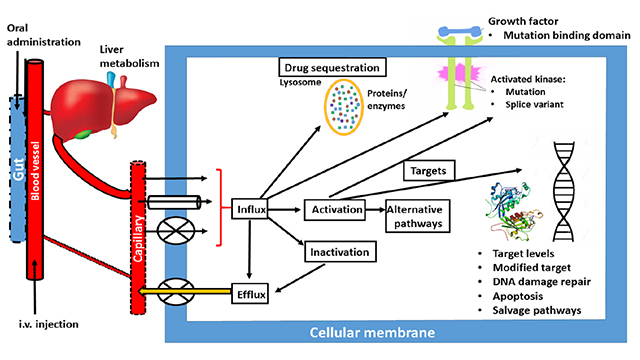 In this review, we summarized the last advances in our knowledge about the role of glutamine metabolism in cancer therapy. 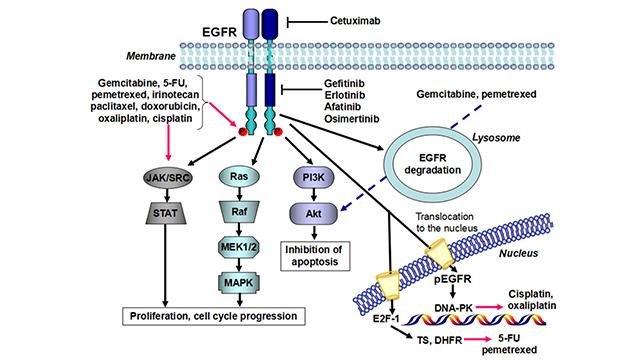 Aberrant activation of the epidermal growth factor receptor (EGFR) is a driving force for cancer growth in a subgroup of non-small cell lung cancer patients. These patients can be identified by the presence of activating EGFR mutations. Currently three generations of EGFR-tyrosine kinase inhibitors (TKIs) have been approved by the Food and Drug Administration and European Medicine Agency. This paper reviews the structure of EGFR and the downstream signaling pathways of EGFR and describes the mechanisms of intrinsic and acquired resistance against EGFR-TKIs. 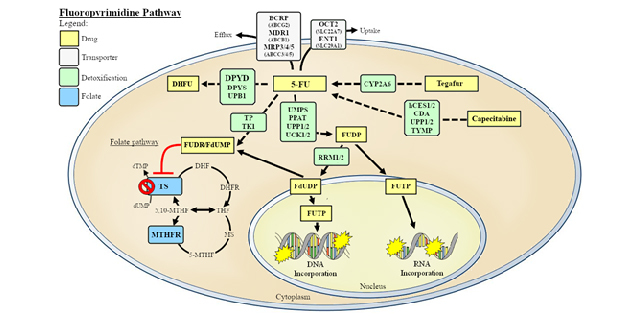 These mechanisms include secondary or tertiary mutations in EGFR, the activation of bypassing signaling pathways or a histological transformation to small cell lung cancer. Moreover, drug efflux transporters will affect the cellular accumulation of EGFR-TKIs and penetration of the first generation of EGFR-TKI into the brain. 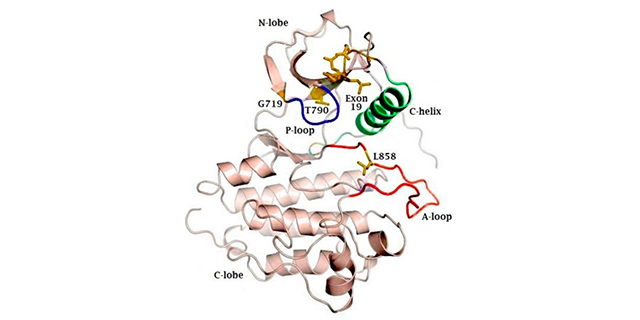 Lysosomal sequestration of some EGFR-TKIs may also prevent the drugs to reach their target. In conclusion, resistance to EGFR-TKIs is multifactorial, including primary and acquired mutations in the EGFR gene, activation of bypassing pathways and limited uptake of drugs in the cells or target tissues. More pharmacological studies are needed in order to develop new specific compounds targeted to overcome new resistance mechanisms in order to enable a personalized treatment approach. Targeted therapies in cancer: where are we going? Receptor tyrosine kinases (RTKs) bearing oncogenic mutations in EGFR, ALK and ROS1 occur in a significant subset of lung adenocarcinomas. Tyrosine kinase inhibitors (TKIs) targeting tumor cells dependent on these oncogenic RTKs yield tumor shrinkage, but also a variety of adverse events. Skin toxicities, hematological deficiencies, nausea, vomiting, diarrhea, and headache are among the most common, with more acute and often fatal side effects such as liver failure and interstitial lung disease occurring less frequently. In normal epithelia, RTKs regulate tissue homeostasis. For example, EGFR maintains keratinocyte homeostasis while MET regulates processes associated with tissue remodeling. Previous studies suggest that the acneiform rash occurring in response to EGFR inhibition is a part of an inflammatory response driven by pronounced cytokine and chemokine release and recruitment of distinct immune cell populations. Mechanistically, blockade of EGFR causes a Type I interferon response within keratinocytes and in carcinoma cells driven by this RTK. This innate immune response within the tumor microenvironment (TME) involves increased antigen presentation and effector T cell recruitment that may participate in therapy response. This TKI-mediated release of inflammatory suppression represents a novel tumor cell vulnerability that may be exploited by combining TKIs with immune-oncology agents that rely on T-cell inflammation for efficacy. 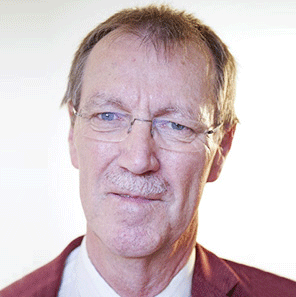 However, early clinical data indicate that combination therapies enhance the frequency and magnitude of the more acute adverse events, especially pneumonitis, hepatitis, and pulmonary fibrosis. 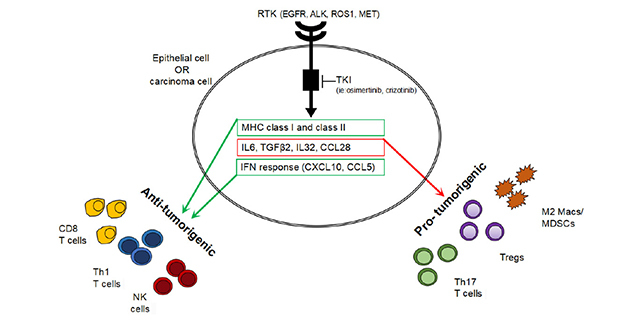 Further preclinical studies to understand TKI mediated inflammation and crosstalk between normal epithelial cells, cancer cells, and the TME are necessary to improve treatment regimens for patients with RTK-driven carcinomas. Soluble resistance-related calcium binding protein (Sorcin) is a protein initially labelled “resistance-related”, since it is co-amplified with ABCB1 in multidrug (MD)-resistant cells. While for years Sorcin overproduction was believed to be a by-product of the co-amplification of its gene with the P-glycoprotein gene, many recent studies view Sorcin as an oncoprotein, playing an important role in MD resistance (MDR). 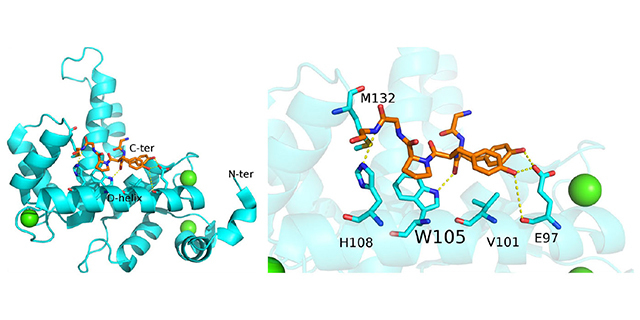 Sorcin is one of the most highly expressed calcium-binding proteins, which is overexpressed in many human tumors and MD resistant cancers, and represents a novel MDR marker. Sorcin expression in tumors inversely correlates with patients’ response to chemotherapies and overall prognosis. Sorcin is highly expressed in MDR cell lines over their parent cells. Sorcin overexpression by gene transfection increases drug resistance to a variety of chemotherapeutic drugs in many cancer lines. On the other hand, Sorcin silencing leads to reversal of drug resistance in many cell lines. This review describes: (1) the roles of Sorcin in the cell; (2) the studies showing Sorcin overexpression in tumors and cancer cells; (3) the studies showing the effects of Sorcin overexpression and silencing; (4) the molecular effects of Sorcin overexpression; and (5) the structural and genetic bases of Sorcin-dependent MDR. Cellular homeostasis crucially relies on the correct nucleocytoplasmic distribution of a vast number of proteins and RNA molecules, which are shuttled in and out of the nucleus by specialized transport receptors. 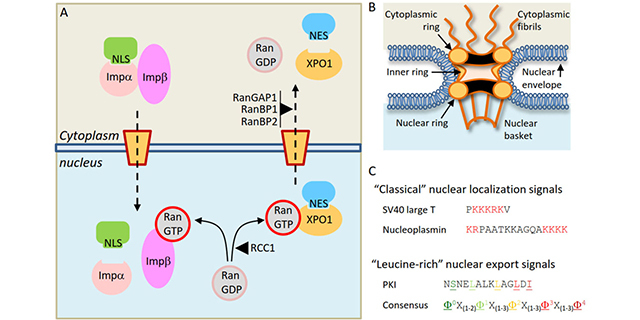 The nuclear export receptor XPO1, also called CRM1, mediates the translocation of hundreds of proteins and several classes of RNA to the cytoplasm, and thus regulates critical signaling pathways and cellular functions. The normal function of XPO1 appears to be often disrupted in malignant cells due to gene mutations or, most commonly, aberrant overexpression. Due to its important physiological roles and its frequent alteration in human tumors, XPO1 is a promising target for cancer therapy. XPO1 inhibitors have undergone extensive testing as therapeutic agents in preclinical models of cancer, with promising results. One of these inhibitors, Selinexor, is currently being evaluated in multiple clinical trials of different types of solid tumors and hematological malignancies. Here, we review several key aspects of XPO1 function, as well as the mechanisms that may lead to its alteration in cancer, and provide an update on the status of XPO1 inhibitors being developed as drugs for cancer therapy, including the definitive results of the first clinical trials with Selinexor that have been recently published. To receive email updates about the journal, please subscribe here. 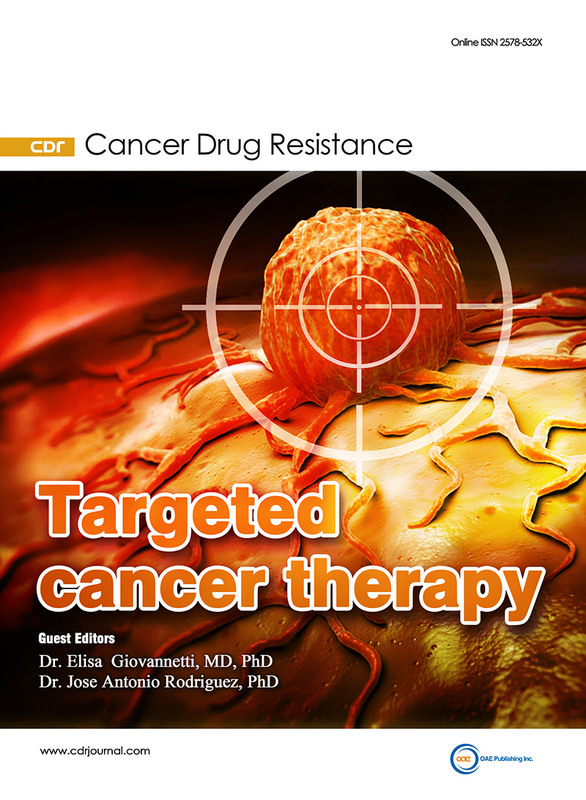 Cancer Drug Resistance is published by OAE Publishing Inc.